As investors, we often don’t have the luxury of choosing how our investment is designed. However, it is important to note the impact that design can make on an assets performance. There are various elements that can make a pivotal difference to how tenants and owner occupiers see your property. All of which must be considered before the initial purchase. What should you avoid when you can’t inspect the property before you buy, such as a brand new, off the plan property. The features that set apart the good from the bad can seem to be miniscule, but can create a major impact on a property’s liveability and overall performance. Blue Wealth’s approval process automatically rejects inferior properties with these unappealing elements – allowing our clients to gain access to only the strongest investments within a project. So, what should you avoid? Apartments with no significant bedroom, or what is known as a “flexi” wall are automatically rejected. These features can often minimise resale value, as they fail to attract the demand of the owner occupier market. 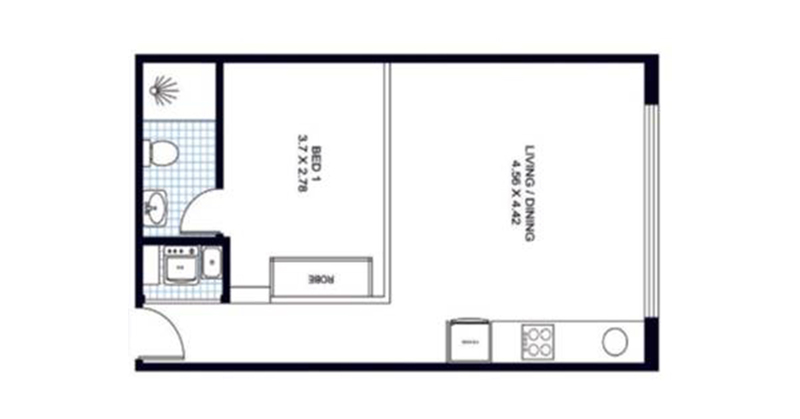 The difference between a genuine 1-bedroom apartment and a studio can look miniscule on a floor plan. However, when it comes to rent or sell the investment, there is a vastly contrasting performance between the two. 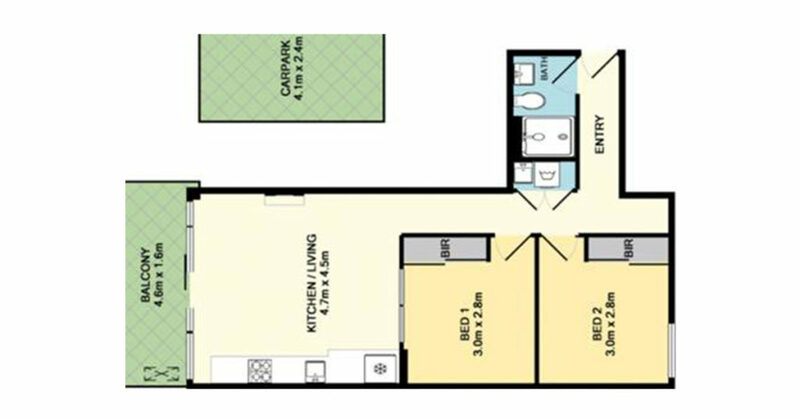 As seen in the below floor plan, although this may look like a 1-bedroom apartment, in reality the kitchen, dining, living and bedroom space are all connected. This makes for a far inferior property when presented to the open market. As for 1-bedroom, 1-bath floor plans with an internal floor space below 50m2, and 2-bedroom, 2-bath floor plans below 70m2, these are automatically rejected by the Blue Wealth model. These floor plans are regularly smaller than what is needed for an attractive layout and are often known as “investor stock”. Floor plans often have unappealing layouts or are restrictive in living spaces when below these sizes. 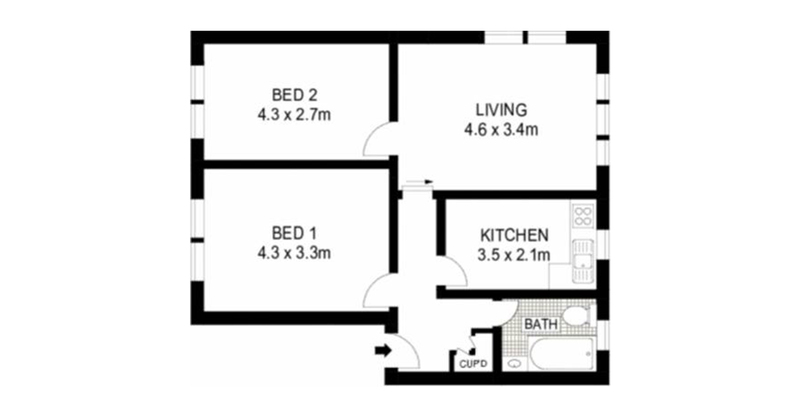 An example of this can be seen below, where most of the floor space is dominated by bedroom accommodation. Bedrooms without external facing windows are often avoided by the general market and are consequently rejected by Blue Wealth. The idea of “borrowed light” from living areas reduces the liveability of a property. Natural outlooks or aspects from bedrooms is more sought after by tenants. Our model disregards this type of structure as a 2-bedroom apartment, however a more accurate representation of this floor plan is a 1-bedroom plus Multi-Purpose Room. Investors are misled into buying these properties by lower price points. But you must ask yourself why, before you buy. Often the cheaper properties are those that can’t sell, or require a price reduction to get a buyers attention. The best investment is not always the cheapest and it can show in your assets end perfromance. At Blue Wealth, we aim to give our clients access to the best properties, while leaving investments with these inferior traits to the rest.